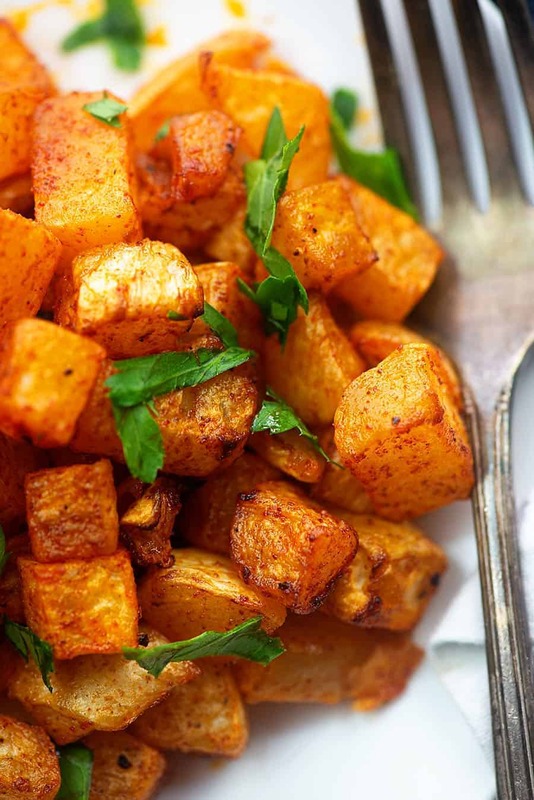 Roasted turnips might just be one of my new favorite discoveries while eating low carb! 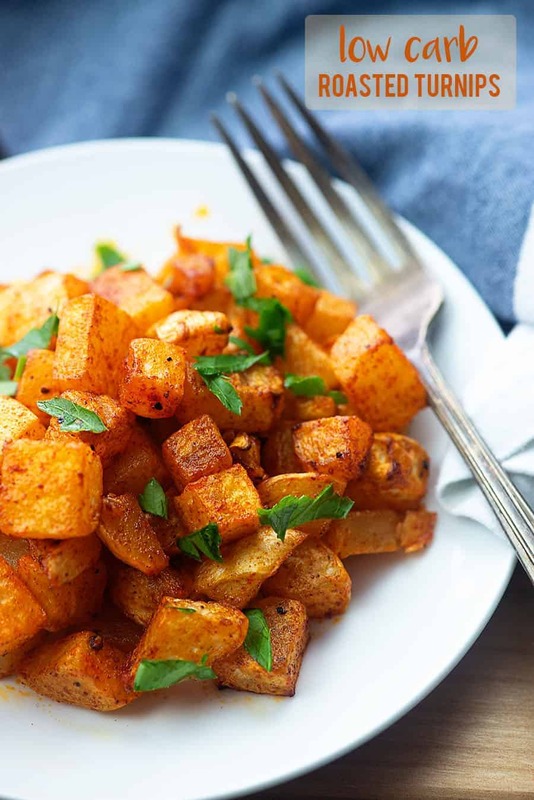 They’re subtly sweet, oh so creamy, and they make the perfect side dish for breakfast or dinner! I’ve been on a big radish kick lately since those are such a great replacement for potatoes, but I think I was beginning to burn out my family. I switched things up and started playing around with turnips. To be honest, we’d never eaten turnips before recently so these were totally new to us and I’m happy to report: They’re a hit! 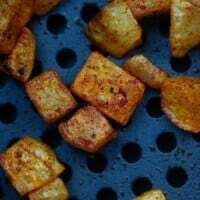 I busted out the air fryer for this recipe, because I love how quickly it cooks things and how easy it is to use without heating up the whole oven/kitchen, but I’m also including instructions for roasting turnips in the oven below. Check the recipe card for details! To start, you’ll want to grab a couple of turnips. I like to peel mine before cooking, but it’s not strictly necessary. 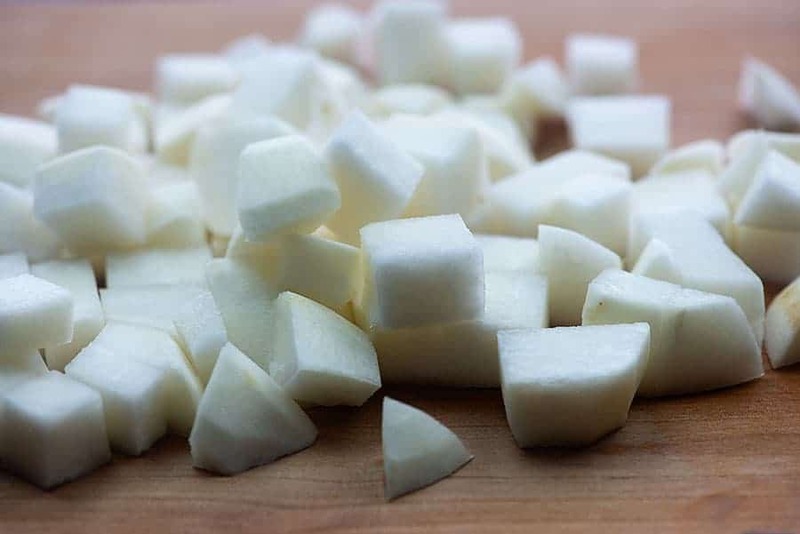 Dice the turnips up into small chunks. I’m keeping these roasted turnips nice and simple and just tossing them in a little oil and seasoning. You can add whatever seasonings you like though. I use avocado oil (affiliate link), because it’s a nice neutral oil, great at high temperatures, and it’s keto-friendly. I seasoned the turnips with paprika, salt, and pepper. Super simple, but feel free to play with the spices to suit your tastes. 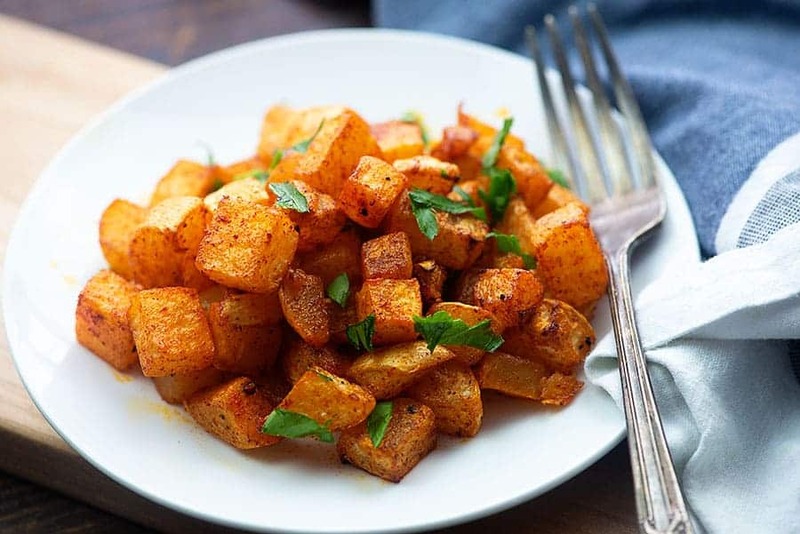 Toss the turnips in your preheated air fryer and cook for about 10 minutes. Shake the basket halfway through cooking. They come out all roasted on the outside and super creamy on the inside. Serve these turnips alongside my baked cod or one of my shrimp recipes! The same method applies as above. Season up your turnips, but place them on a baking sheet instead of in an air fryer. Roast at 450 degrees for 20-25 minutes. They get so soft and creamy and delicious. Turnips have a bad rep of being bitter. And yes, they definitely can be bitter – the larger and more old a turnip is, the more bitter it will taste. Choose turnips that are about the size of a tennis ball. Roasting them like this helps bring out the natural sweetness. Are turnips good for a low carb or keto diet? Turnips are perfect for a low carb or keto diet! 1 medium turnip has 8 grams of carbs and 2.2 grams of fiber, making one whole turnip just 5.8 net carbs. They’re also a good source of Vitamin C! Cauliflower Casserole: You won’t miss the potatoes with this one! Brussels Sprouts with Bacon: Bacon really does make everything better! Broccoli Salad: If you love cheddar, bacon, and ranch you really have to try this! Coleslaw: This is my mama’s famous recipe! 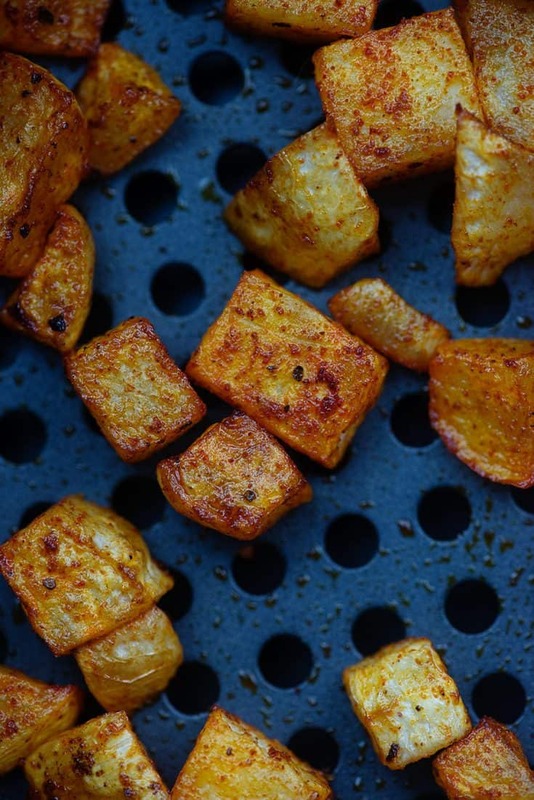 Roasted turnips in the air fryer turn out so creamy and delicious in just 15 minutes. Preheat the air fryer to 390 degrees or the oven to 450 degrees. Peel and dice the turnips and place them in a medium mixing bowl. Add the avocado oil, paprika, sea salt, and pepper to the bowl and toss to coat. 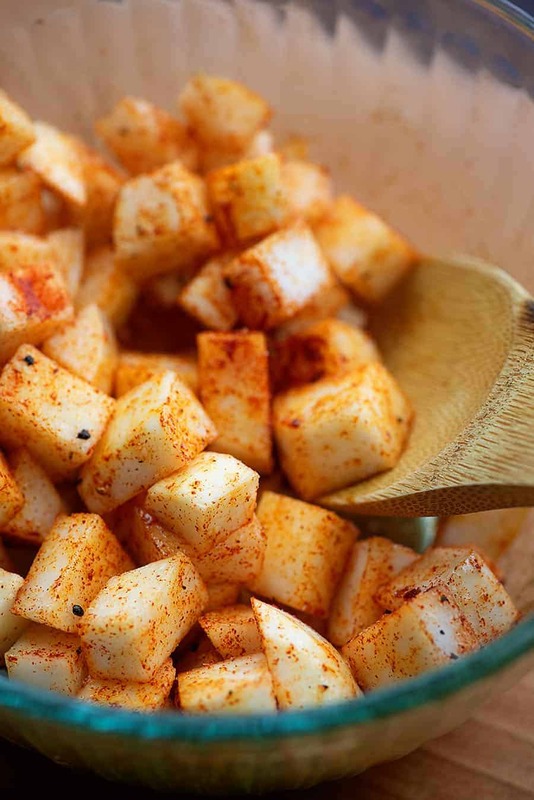 Spread the turnips in an even layer in the air fryer basket or on a large baking sheet. Air fry for 10 minutes, shaking the basket once halfway through cooking. Alternately, bake for 20-25 minutes or until the turnips are as soft and browned as you'd like. We just had turnips (a first for us!) last Sunday for breakfast, I diced them & seasoned them exactly like you did but I pan fried them. It took forever & they still weren’t quite as done as I would have liked so I am trying your roast in the oven method next. Even with them not being quite done we were so impressed! My hubby has missed his spuds for breakfast I think 🙂 We will for sure be trying them again, what a great find! Yay, I love all your recipes so I’m excited for that one! Great job again Karly! And thanks so much for not leaving us non-air fryer owners in the rear view mirror. Would love to have one but sadly my kitchen is small as is my pantry so no place for a home for a fairly good size appliance. Will add this to my low carb file which is filled with wonderful selections thanks to you! Hope you enjoy, Vickie!! I really do love my air fryer, but it definitely takes up some space! I went shopping last week. I had never bought a whole turnip before. I had always bought turnip greens. The only ones they had were large. I got one anyway, but it turned out to be to hard to slice? ?